On the first weekend of April we thought we could pull off a camping trip with good friends Amy and Kristofer. We packed up the bags and car and took off North! 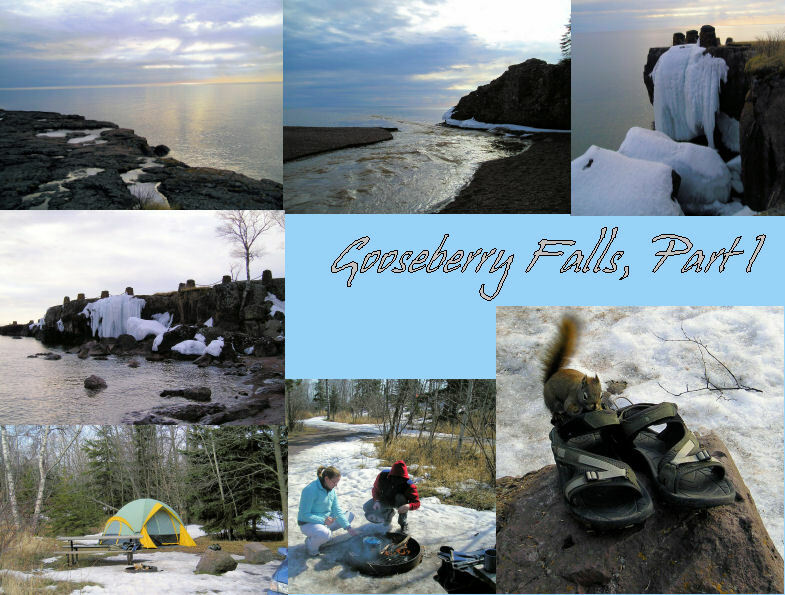 We drove a couple hours ending at Gooseberry Falls, just north of Duluth, right on Lake Superior. We knew it would be tent camping with no water. We ended up being the only campers for the weekend. The next several posts will highlight the trip with photographs. I'll try to provide some commentary along the way! This first part shows (starting bottom left going counter-clockwise) our campsite with the tent pitched. Our tent wasn't actually on any snow although it was pretty much all around the campsite. It got into the 30's at night but Saturday ended up in the upper-40's if not 50's. Next is Christy and Kristofer cooking breakfast over the open-fire! We ended up having to cook all our meals this way because the stove wasn't working properly. This little squirrel was quite friendly and was scampering about for several minutes. He liked my tevas which were just sitting on the rock. It was funny to watch him run around. The next several highlight the scenic views of Lake Superior. We were about a quarter of a mile from the Lake on one side which was all rock cliffs and some great viewing and about a 1/2 mile away from the actual beach which was also some great views. The snow on the rock faces was amazing. It was so cool to see how the water had just frozen and hadn't melted yet. These were all on the north face of the rocks which is why there is still so much snow! The middle top is actually a picture looking down the Gooseberry River towards the Lake. Definitely some beautiful scenery... and we haven't left the campground area yet!